Seeing a herd of caribou in the wild is a truly magical experience. During one winter I was hiking in the rocky mountains with several friends. We came across a field and there were (what seemed to be) hundreds of caribou. I would compare that experience to seeing the northern lights because it made me feel so in touch with the beauty of nature. 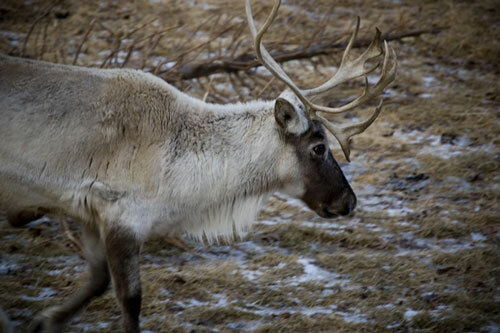 Below there are plenty of neat and interesting facts about caribou! Distribution/Location: Caribou are mainly found in the northern regions of North America. They can also be found in northern europe and asia; however, they are usually referred to as reindeer and more commonly found domestically. 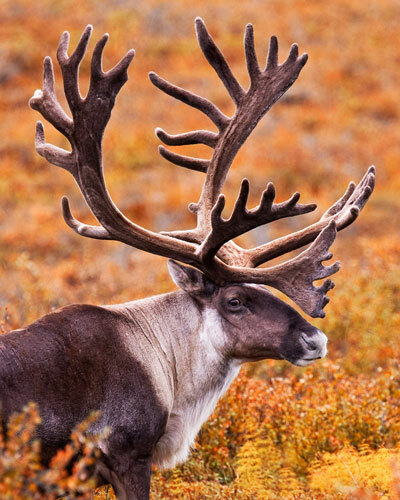 Caribou are found in tundra and taiga regions (depending on the season). They move around during the year in order to find the best shelter and nutrients. 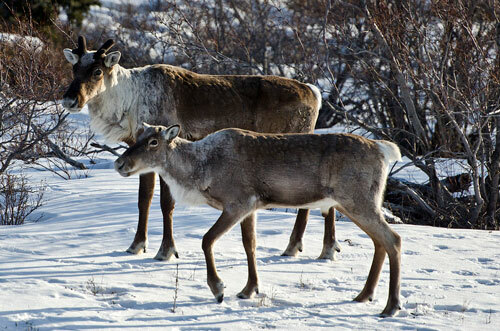 Appearance: Caribou have dense, chocolate-brown coats of hair with a white neck and flank (backside). They have two layers of fur to keep them extra warm (a tougher outer coat of hair as well as a soft and wooly undercoat). Their hair contains air pockets that helps to keep the animal warm and also makes them more buoyant while swimming. Caribou have wide, fur covered feet that help them stay warm and move through diverse terrain. The hooves have a hollow like shape right at the bottom with sharp edges. These characteristic allow their hooves to act as snowshoes during the winter. Interestingly, the shape of the hooves are also great for travelling through water (like paddles). Male – description: Male caribou (also referred to as bulls) are about 150 kg. An easy way to tell the difference between females and males is by the size of the antlers; male caribou have larger antlers. Bulls also have larger white spots around their necks—especially leading up to mating season when the male neck becomes bigger to prepare for ruts (see mating section). Female – description: Female caribou (also referred to as cows) are under 100 kg. They have straighter antlers that don't curve and branch as much. Cows also retain their antlers through the winter until they give birth, making it easier to forage for food. Antlers: Caribou antlers are very large. 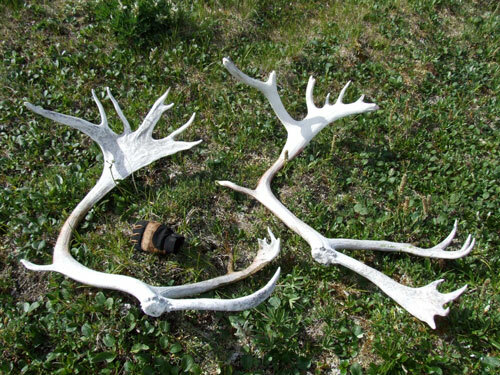 They grow on the male and female, the antlers of male caribou are larger. Each year in March, the antlers start to grow but are covered in a special fuzzy skin called velvet. In September, the velvet begins to come off (some caribou aid this process by running it against rocks and branches which leads one to believe that it can be uncomfortable). While the velvet is coming off, the antlers look quite pink… the velvet was living skin and the pink colour comes from the blood coming through. Once the velvet is off, the antlers harden to a bone white with no more blood. Early each winter the antlers of the males fall off and the whole process begins again the next season. 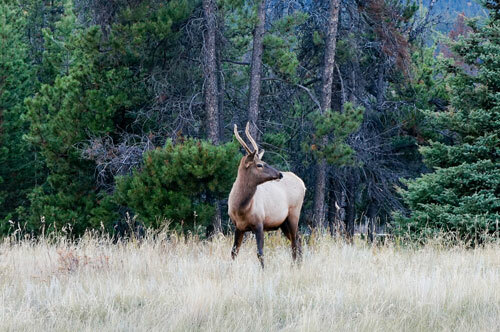 The females don’t lose their antlers until after they give birth. Diet: Caribou have a four chambered stomach, like cows, to allow them to better digest their food. They chew, regurgitate and rechew their food. In the summer the eat a variety of vegetation including grasses, seeds, berries and leaves. During the winter, they live off of lichen, dried grass and willow twigs. Caribou use their hooves to dig and scoop through the winter snow to get to the lichen it likes to eat. 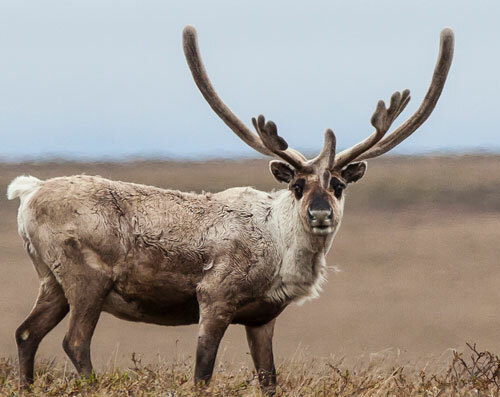 Habitat: During the winter, caribou will often spend time in less sheltered areas — despite the cold and wind, these areas are attractive to the caribou because the wind swept ground is less snow covered making the lichen easier to access. 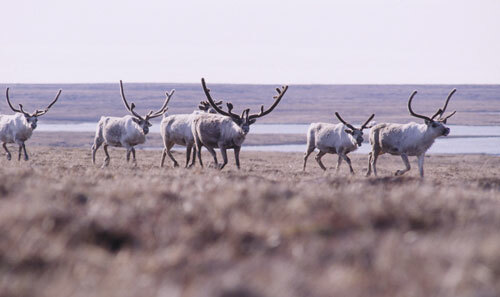 Migration: Caribou are known for their migrations. They stay together in herds, moving almost constantly. In spring they migrate north to give birth — this spring migration is the furthest they go in the shortest time and can be as much as 1000 km. During the summer, they spread across the tundra in smaller groups to feed. In fall, they group together again into larger herds for breeding. They stay in these larger groups throughout their winter migration to the “taiga” regions which are the areas just south of the tundra. The taiga has very similar plants and animals to the tundra, but isn’t as barren or as cold. Mating: During the fall mating season (usually October – November) bulls will perform ruts—where two males run at each other and lock antlers to establish their dominance and win the attention of female caribou. The male caribou that does the best in a rut will be able to select female caribou to make groups (also known as “harems”) of anywhere between 5 and 15 caribou. Male caribou will mate with more than one female each year because caribou are "polygynous" breeders. 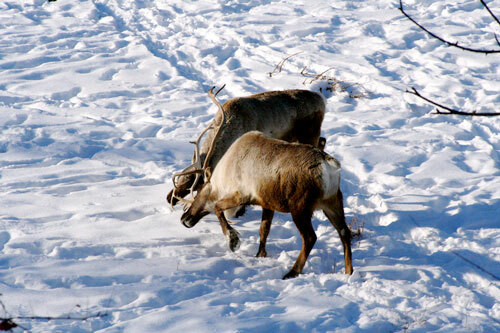 Breeding: Since mating occurs in the fall, most calves (baby caribou) are born in late spring—mainly in may and june. Luckily for the young caribou, food is bountiful during this time of year, so they will have lots of nutrients in order to grow! Caribou young are surprisingly small when they are born (only 10 pounds!) yet they are able to walk on their own in as little as 30 minutes. They nurse for a few weeks but begin to transition to grazing on plants at three weeks. Their fast development means they are able to live independentally by the fall. Although, female caribou don't reach full maturity until about 2.5 years. 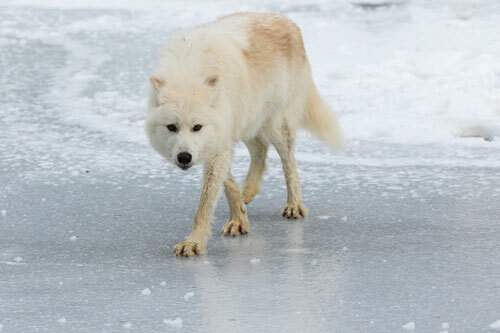 Predators: The main predators for caribou are wolves and human hunters but they are also feasted upon, while alive, by biting insects including warble flies, horseflies, deerflies, blackflies, bot flies and mosquitoes. They time their pregnancies so that the babies are born and strong enough to survive the unbelievable deluge of biting flies that hits the tundra region in late June each year. The sheer numbers of biting insects have a very real ability to weaken these large mammals. Caribou travel in herds and have adapted to help protect each other. 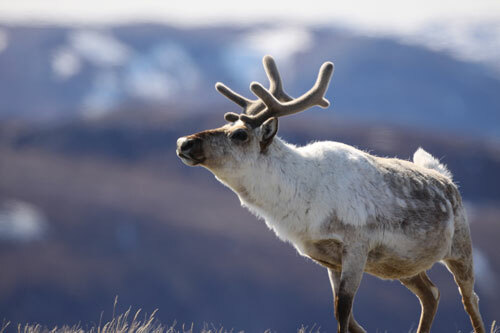 They have a special gland at the ankles which release a special scent when a caribou is endangered by predators. The special scent warns other caribou to stay away and protect themselves. 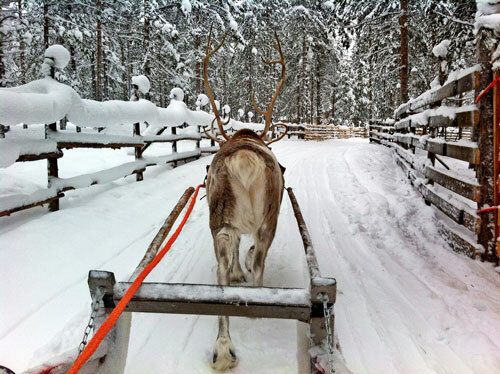 Reindeer and caribou are technically the same species, but caribou have never been domesticated and reindeer are most commonly found on domestic farms or conservations. Caribou can run as fast as 50km an hour! The Inuit name for the caribou is tuktu. The Woodland Caribou—a subspecies that lives in the boreal taiga regions of Canada and a small part of the United States— is an endangered species, mostly due to habitat loss. Caribou are the only species of the cervid (deer) family where both the female and male animals grow antlers. Caribou tend to live for about 15 years.